After the original Lume Cube, here comes the upgrade. Lume Cube AIR has just been released, and it’s a lighter, slimmer and more portable lighting solution for content creators. Just like its predecessor, it’s durable, shock-proof and waterproof, and it’s an affordable little light. The Lume Cube AIR has a CRI rating of +/- 90, a 5700K daylight balanced color temperature, 400 LUX at 1M power, and a 60-degree beam angle. When it comes to the size, the Lume Cube AIR weighs 2 oz (56g) and the overall dimensions are 1.625” x 1.625” x 1.125”. For now, it’s the most portable light of this kind on the market. It’s waterproof down to 30 feet, so it’s suitable for filming underwater or in the rain. The Lume-X iOS or Android app allows you to control multiple Lume Cube AIR lights. You can control brightness, light mode, strobe speeds, battery levels, and more. The light comes with a tripod mountable thread and a built-in magnet for more mounting versatility. In our “death match” between Lume Cube and Litra Torch, it turned out that the quality of light wasn’t exactly ideal for photographing or filming people. 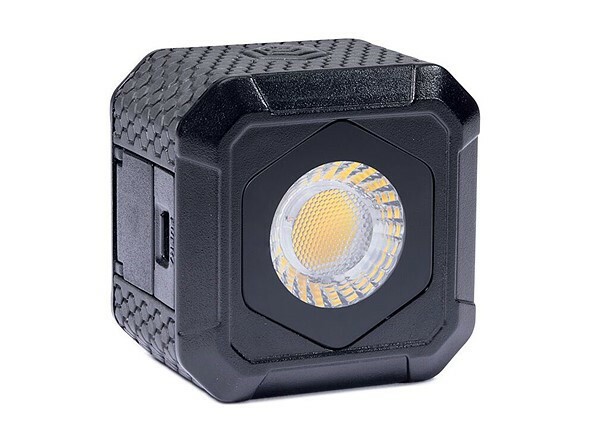 According to the manufacturer, the LED output has been improved in Lume Cube AIR. It also comes with two diffusers included: a white Diffusion Bulb and an orange warming Diffusion Bulb for better skin tones when filming. So, perhaps the new version will be more flattering for filming and photographing people than the previous one. The Lume Cube AIR is available for orders and you can get it for $70, along with the two diffusers, a lanyard, and a micro USB charging cable.